Former SR-71 pilot "Buz" Carpenter will be making a return visit to the Cosmosphere by popular demand on November 6. Carpenter flew the Blackbird now housed at the Cosmosphere and will speak about the plane and his experiences piloting it. He will speak November 6 at 1 p.m. and 3 p.m. It is free and open to the public. He will sign autographs following the presentations. Carpenter accrued 777 hours flying SR-71 planes, including 961, which resides at the Cosmosphere. He flew Blackbirds as an aircraft commander and later as an instructor pilot, with over 60 operational missions. He also flew in the C-141, RF-4C, and T-38 planes, flying 150 combat hours in Vietnam. The Cosmosphere also has a T-38 on display. Carpenter worked in the Pentagon and served as Wing commander at Ramstein Air Base in German during Operations Desert Shield and Desert Storm. He retired as a Colonel after serving as the 2nd Air Force Vice Commander, responsible for all the USAF Intelligence, Surveillance and Reconnaissance flying assets. 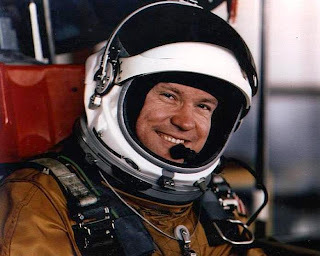 He is currently a docent for the Smithsonian Institution's National Air and Space Museum. Only 32 Blackbirds were ever made, and they were in service from 1964-1998. Despite over 4,000 attempts to shoot them down, none of the planes were lost due to enemy fire. However, 12 of them were destroyed in accidents. The plane was designed to be one of the first planes not detectable by radar. Unfortunately, radar technology was advancing at a rate that outpaced that particular design feature. The great defensive ability of the plane was its high speed and altitude. Standard evasive action was just to accelerate, which made it almost invulnerable to the attack technologies of the time. The top speed of the plane was mach 3.3 (2,200 miles/hour or 26 miles/minute). In 1990, during a speed test, an SR-71 flew from LA to Dulles Airport in 64 minutes. They flew faster than a bullet from a standard 30.06 hunting rifle. I will inform my Air Force Academy Candidates of this event and Air Force Academy Liaison Officers from this part of the State. Thanks, Col. Bender, for helping spread the word. Buz Carpenter was a huge hit last year when he visited. Very personable and very interesting.